Ichimoku Kinko Hyo is a Japanese phrase meaning “one-glance equilibrium chart.” It is a technique that uses moving averages but in a unique way to display the current balance of market conditions, including support and resistance and implied momentum. The important word here is “glance,” or a one-size-fit-all set of specially constructed moving average indicators that summarize the price action on your chart. The moving averages are calculated to measure areas of support and resistance, but also to place the current price in the context of the past, current, and future trends. Ichimoku is one of the only indicators that actually contains a forecast, although we often rely on extended support and resistance lines and channels, too, and attribute forecasting capability to standard momentum indicators (and Gann fan lines). A note on translations: “One-glance equilibrium chart” makes little or no sense in English. Ichimoku means “glance” and hyo means “charts,” so that’s easy enough, but kinko means “confinement or imprisonment,” but also safe, vault, or treasury. Most descriptions of the technique translate kinko as equilibrium, which is at least a word used in economics and finance. In practice, the word in Japanese for equilibrium is heiko, but never mind. Nicole Elliott in her excellent book, Ichimoku Charts (Harriman House, 2007) translates kinko as balance, so we might go a step further and say that in interpreting an Ichimoku chart, we seek to find where the balance of forces may lie. This does make sense. It would be nice to have a valid translation or at least some words that would give us an intuitive grasp. In the absence of clarity, Ichimoku takes on a bit of a mystical or magical air. Do not buy into it. Ichimoku, like all indicators, is based on arithmetic, specifically, past data. The originality of the calculation methodology and the initially strange-looking charts do not override that Ichimoku is just another set of indicators based on past data, like all other indicators. As for extending indicators out into the future, we already do that quite often with some indicators, such as triangles, channels, support and resistance lines, and others. 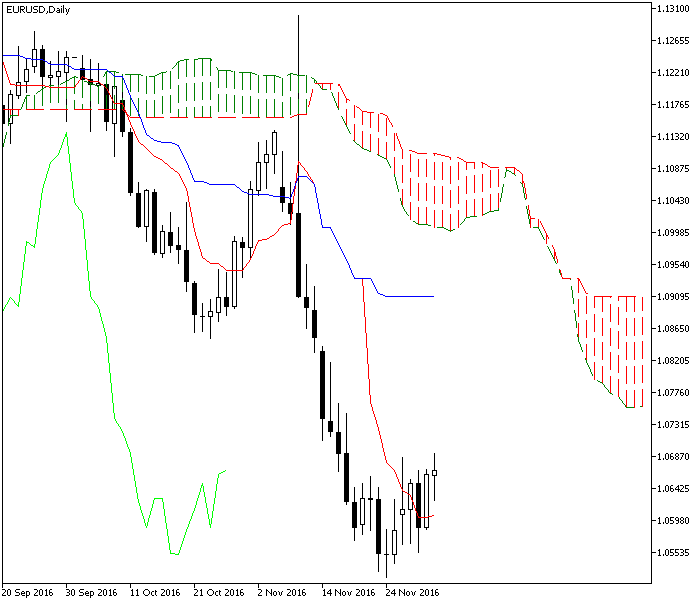 Having said that, the Forex world has rushed to embrace Ichimoku because it works, offering that one-glance capability in a chart world that contains conflicting signals. You can have eight or ten indicators and half of them will say buy and the other half will say sell. Ichimoku is a welcome tie-breaker. In addition, the Ichimoku calculation methodology uses the average of the highest high and lowest low over the past X number of days. In a market like FX that trades almost 24 hours a day and has only an arbitrary open and close, this version of the midpoint is appropriate and useful. And most of all, we find that one of the Ichimoku indicators has an accuracy rate of over 75% (see below). No other indicator can make this claim. That makes learning foreign words and a new way of displaying indicators on a chart very compelling. Many Ichimoku adherents claim Ichimoku is a trading system in its own right, which was the goal of its inventor, although some analysts think that overstates the case — for one thing, for trading signal purposes, it is most useful in trending markets and less useful in range-trading markets (which is true of all indicators based on moving averages). In addition, Ichimoku was designed to be used on the daily chart. This is because the close is the most important component of the bar. It summarizes the ruling sentiment of the day. But in the first few hours of trading, you might have a doji (open and close the same) on the 240-minute chart, so you would literally be looking at the wrong candlestick interpretation. This is not to say Ichimoku cannot or should not be used on a chart of less than a full day, but it is to issue a warning: do not use a screwdriver to pound a nail. Books in English and other Western languages, describing the methodology, started appearing in the late 1990’s and if you look at the Amazon list of books specifically on Ichimoku and Forex, you will find only about 100, most of them published in the past few years. Considering that books on technical analysis number over 18,000, Ichimoku is a relative newcomer. Ichimoku Kinko Hyo seems to be an elaborate system, but in the end, the underlying basics are simple and familiar. The essence is to use specific ways of calculating and displaying moving averages to derive a comprehensive understanding of the price action. You cannot do that with standard moving averages and not with just one or two — you need fancier versions and unconventional display. It is a curiosity that the Ichimoku moving average numbers, 9 and 26, are the same as devised independently by Gerald Appel in the MACD methodology. Note that while Ichimoku charts always use candlesticks to display the bars, it was not originally part of conventional candlestick analysis. All the same, Ichimoku is not a cut-and-dried signaling system. There is plenty of room for interpretation, and one rich source of interpretation material is candlestick analysis. You can use Ichimoku without knowing candlesticks, but you will be doing yourself a favor if you learn at least a handful of the most prominent candlestick patterns. Two primary goals of technical analysis are to determine whether a trend exists (and which direction it is headed), and when a trend is nearing reversal. Ichimoku analysis answers both questions. Ichimoku uses five lines. Two of the lines form borders for a “span” or cloud-like shape that defines areas of support and resistance. Normally, support and resistance are expressed as a single number, either sloping as in hand-drawn diagonal lines connecting lows or highs, or horizontal as in historical highs-lows or pivot points, Ichimoku offers a third version — a region or area of support and resistance less rigidly expressed. This “cloud” if formed by two moving averages and always filled in with one of two colors to make it more visually compelling. Tenkan-Sen is calculated by taking the highest high over the past 9 periods plus the lowest low over the same period and dividing by 2. Note that this is not the midpoint averaged over 9 days. If the Tenkan-Sen is rising or falling, you have trendedness. If the Tankan-Sen is horizontal, you do not have a trend but rather range-trading. It is normally displayed as a red line. Tenkan thus gives two useful pieces of information: trendedness and rough support/resistance. Kijun-Sen performs the same calculation, the highest high plus the lowest low divided by 2 but over a longer time period, 26 days. Kijun-Sen is another trendedness indicator and also support/resistance, but can have a third function — forecasting the upcoming price moves. When the current price is above the Kijun-Sen line, we expect the move to continue higher. The Kijun-Sen is normally displayed as a blue line. One application of the Kijun-Sen is to consider it as naming a trailing stop. Kumo or the cloud is formed by coloring in the space between two other indicators, defined below. The cloud borders form both current and future support and resistance levels. A fat cloud indicates big prices changes over the time period included, while a skimpy cloud implies a more easily broken support or resistance. A fat cloud gives you confidence that the price will not break support or resistance. A skimpy cloud might break and here is where conventional candlestick analysis comes in handy — you examine the candlesticks breaking into the cloud to see if they are continuation or reversal candlesticks. A reversal candlestick like a shooting star would alert you that the move is ending. Senkou Span A is the “leading” span that forms the most forward points on the chart. It takes the Tankan-Sen plus the Kijun-Sen divided by 2 and projected out 26 periods. If your price lands above the topmost span line, the top edge of the Kumo or cloud, it becomes support. Senkou Span B is a longer-term indicators, also called leading span, measured by taking the highest high plus lowest low divided by 2 over the past 52 time periods and projected out 26 periods ahead. It is logical that when the shorter-term span, Span A, is above Senkou Span B, the price trend is rising. The opposite is true when Span B is below Span A. The process of switching from bullish to bearish is named a Kumo twist and can be useful in predicting a change in direction, similar to a moving average crossover. Now Ichimoku is going to get a little freaky. To the clouds formed by spans described above, we are going to add another indicator: the Chikou span. The Chikou line is today’s price projected back 26 days. It may seem silly, but even such a lagging indicator as this has powerful predictive value when it executes a crossover. But like any moving average, a crossover by the Chikou line of the current price or the span or both is signal of directional change. In Forex, the direction of the Chikou line correctly predicts the direction of the next period’s price move about 75% of the time. Chikou is usually displayed as a green line. The cloud and the Chikou line together give you the condition of the market at a glance. When the Chikou line is above the price bars, sentiment is still bullish. But when the Chikou pokes itself downward into the tangle of bars, it means today’s price is lower than prices over the past 26 periods. You can see “at a glance” that sentiment is shifting. Last price close is above the Chikou line, but the cloud resistance is far away. It should be obvious that the trend is bullish when the price is above the cloud and bearish when the price is below it. When prices are within the cloud, you fall back on candlestick analysis, as noted above. Secondly, the fatness of the cloud is an indicator of the robustness of the trend. A far cloud should give you comfort that you have identified the direction of the trend correctly. And the display methodology is impossible to misinterpret because support clouds are colored a different color from resistance clouds. Usually support clouds are green (“go”) and resistance clouds are red (“stop”), but whatever colors your charting software uses, you always know at a glance which is which. Therefore, when the color of the cloud changes from one color to the other, you have confirmation of a change in trend direction. The Chikou line, which is today’s price projected back 26 days, gives a bullish signal if it is above the cloud and above today’s candlestick. In practice, simply noting the direction and the slope of the Chikou delivers a forecast for the direction of the next price move. This works very well in Forex. EarnForex offers a free MetaTrader expert advisor implementing Chikou/price cross strategy. Some analysts go so far as to define the clouds as signifying patterns, including Elliott Waves, and to use the size of the waves to determine price targets. In the book Ichimoku Charts, Nicole Elliott describes how to use Ichimoku to derive a timespan principle that projects the next turning point, which is named kihon suchi in Japanese. This entails a great deal of subjective interpretation. 1. Ichimoku is the only charting technique that projects support and resistance into the future. 2. Ichimoku is basically the same as the crossover of two moving averages. 3. The close always gives a better sentiment reading than the high-low midpoint in Forex. Topic 13 - Is There a Best Indicator?